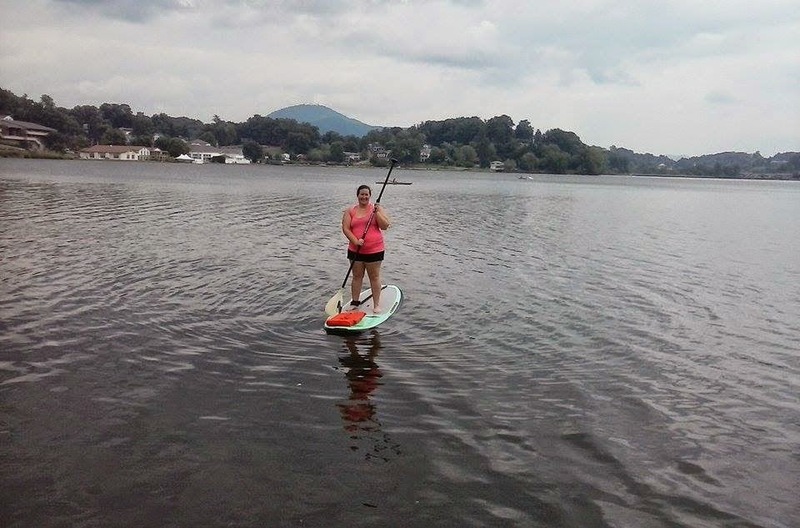 The Peculiar Treasure: Weekend with my Hubby and Paddle-boarding! Weekend with my Hubby and Paddle-boarding! This weekend I wanted to make sure I got some quality time with Taylor before teaching starts back up tomorrow. We never really just carve out intentional time with each other. It usually just happens when it happens. On Saturday morning the weather was perfect. When I get off from work at 10:00 A.M. it was 60 degrees! We decided to go for a walk around the lake after getting some Bojangles grease in for a late breakfast! Taylor brought Molly so she could go for a walk with us. I'm so glad we went. Not only did we get some much-needed exercise, but we just really had a nice time! After we went home, I laid down and CRASHED. I knew I was tired, but I had no idea how tired until I woke up three hours later! Then we went to Taylor's parents house for dinner. My mother-in-law cooked a yummy meal for us and then we watched Field of Dreams. Its one of Taylor's favorite movies and I had never seen it! It was so good! A little strange, but REALLY good. TODAY was an adventure. I slept decently last night, but I had some bad dreams and was kind of disoriented. Then I went to church and the sermon was amazing, but I was really emotional and tired, which is not a good combination when trying to apply an excellent, but challenging spiritual truth to your life. The way I was feeling really had me down and I wasn't really myself, but I eventually got over it...especially after a little bit of prayer followed up by going paddle-boarding. Paddle-Boarding works your arms, legs, and core. It is such good exercise!